This week we have a review of a fun coffee mystery, Murder Over Mochas by Caroline Fardig. 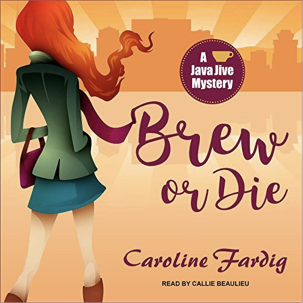 We also have a bonus mini review of the audiobook version of Caroline’s book Brew or Die, and a fun guest coffee post & recipe by Caroline. Details at the end of this post on how to enter to an EBOOK copy of Murder Over Mochas, and a link to purchase it from Amazon. 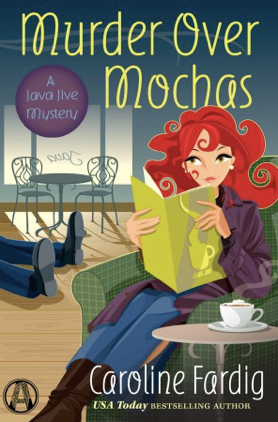 I am new to Caroline Fardig’s Java Jive Mystery series that began in 2015 with Death Before Decaf, so when I was given the opportunity to read book five, I immediately sat down with my own frothy Mocha and was thrilled right off! Caroline starts this adventure with “ex-boyfriend turned friend” and detective Ryder Hamilton inviting Juliet Langley to a gun and knife show…ex turned friend may seem like an oxymoron, but it is a very delightful dynamic. But wouldn’t that be a better invitation for his current girlfriend and Juliet’s BFF Maya Huxley? (That’s another interesting dynamic, but it works for all three of them and me.) But, it’s when ex-fiancé Scott O’Malley pops into the Java Jive Coffeehouse asking for Juliet’s help, he gets a fist in the face…OK, that’s more like it…a bite from Karma! I couldn’t stop turning the pages! Juliet, coffeehouse manager/amateur investigator, should have controlled herself better because that outburst and her history of being abandoned, left broke, stolen from, and holding the reins of a failing business puts her on the suspect list when Scott drops dead in the café. She’s got motive with a capital “M,” but murder? Murder Over Mochas earns 5/5 Marvelous Mochas with a Side of Karma! I was very lucky to have recently won a copy of Brew or Die in its audio version, and it is just as delightful a story enhanced with the very talented, yet traditional, narration by Callie Beaulieu. Juliet has become an official private investigator, and along with managing the Java Jive coffeehouse and juggling several romantic interests she once again falls into the middle of a clever murder mystery. Callie’s narration is much like having Juliet herself reading to me…her tone, emotion, and the occasional change in voice style adds excitement and lots of entertainment. In preparation for writing the Java Jive series, I decided to better understand the coffee culture that I should become an amateur barista myself. I’ve logged many an hour at various coffeehouses and have ingested my weight several times over in espresso drinks and black coffee, but to really connect with my character, I went the extra mile. So I researched decent home espresso machines whose price tag didn’t give me a heart attack and settled on a beginner model. It worked, but I wasn’t getting that nice crema (the lighter brown fluff on top) that a good shot of espresso has. The espresso was meh, and I couldn’t get it to work to make latte art, which was another thing I’d planned to teach myself to do to become one with my main character. In researching what I was doing wrong with the espresso, I found that a big no-no was using already ground beans. Well, after buying the espresso maker, I wasn’t forking out more money for a grinder, so I dealt with it. The latte art was coming along at a painfully slow speed, even after watching hours worth of YouTube videos showing how to do it. A year later, when I was no better at latte art or making espresso, my espresso maker stopped working. This time, I upgraded, and having to replace my busted machine turned out to be a blessing in disguise. Suddenly my espresso was decent tasting, and there was a workable amount of that much-needed crema to make the latte art happen. Still hadn’t given in and bought the grinder, but this machine was good enough that it didn’t matter too much. 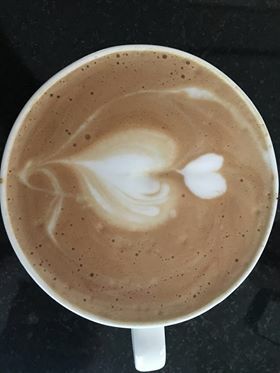 I actually began doing some nice latte art—hearts only, but hey, it was art. Then the unthinkable happened. My machine started malfunctioning, and the only espresso it would make was weak and tasted like bile. Something was wrong with the pump, and my warranty was up. By this time, I was hooked on the stuff, so simply going back to basic coffee was not an option, and I wasn’t driving to the next town to the nearest coffeehouse everyday, either. Time for another espresso maker, and I wasn’t messing around this time. No, I didn’t go for one that cost as much as a car, but I got myself a good one—with a built-in grinder! And a good warranty, just in case. The first pull from that machine was espresso Nirvana—no bitterness, full-bodied, plenty of crema. Pure joy. I suppose the lesson here would be two-fold. If I were just starting out again in the home espresso game, I would probably still go with the beginner machine. Because what if I decided it was too much trouble, and it found its way into the graveyard of kitchen gadgets we all have in the nether regions of our pantries? With daily use, the beginner model will break before too long, and if you’ve decided you can’t live without an espresso machine, then you can replace it with the real deal. But if you like espresso and espresso drinks, you can’t often find a better one than you can make at home. And the best part—no line, no waiting! Like, Visit, and Follow, Oh, my! Along with the very entertaining Java Jive Mystery series, Caroline Fardig is also the author of the just as exciting five-book Lizzy Hart Mystery series beginning with It’s Just a Little Crush. First issued in 2013, Lizzy Hart, another strong and clever character with her own entertaining vulnerabilities, is a copy editor of a local newspaper who finds herself embroiled, of course, in murder and mayhem. To enter to win an EBOOK copy of Murder Over Mochas, simply email KRL at krlcontests@gmail[dot]com by replacing the [dot] with a period, and with the subject line “mochas,” or comment on this article. A winner will be chosen November 18, 2017. U.S. residents only. If entering via email please include your mailing address, and if via comment please include your email address. I don’t like coffee, but I sure love mysteries. Thanks so much for the chance to win. Sounds like a great read over mocha, j/k! somesmartcookle at aol.com. it’s an L, not an I. I’d love a print copy, thanks! I’ve loved other books by Fardig and would expect this to be great, too! I like the description of the book. Sounds like a great read.